Brave the Mayhem or Shop from Home? How do you like to do your Christmas Shopping? Will you venture out into the utter mayhem on Black Friday to fight your way through the crowds of folks who, just the day before were thankful for what they have, but are now aggressively shoving and racing to grab all the things they want? Nothing wrong with that if you like that sort of thing. It's really not my cup of tea and it steals my holiday joy. So, I'll be shopping from the comfort of home taking advantage of free shipping and a warm cup of coffee while nibbling Thanksgiving leftovers. While you're searching through Amazon for that perfect gift or even a gift card, would you consider using my link to begin your search? As an affiliate, I'll earn a little to support my work here at the Woodwife's Journal and you won't feel even a penny increase in your cost! I'd like to say thank you in advance if you do because I really appreciate your help! Don't forget to SHOP LOCAL to support your friends and neighbors! 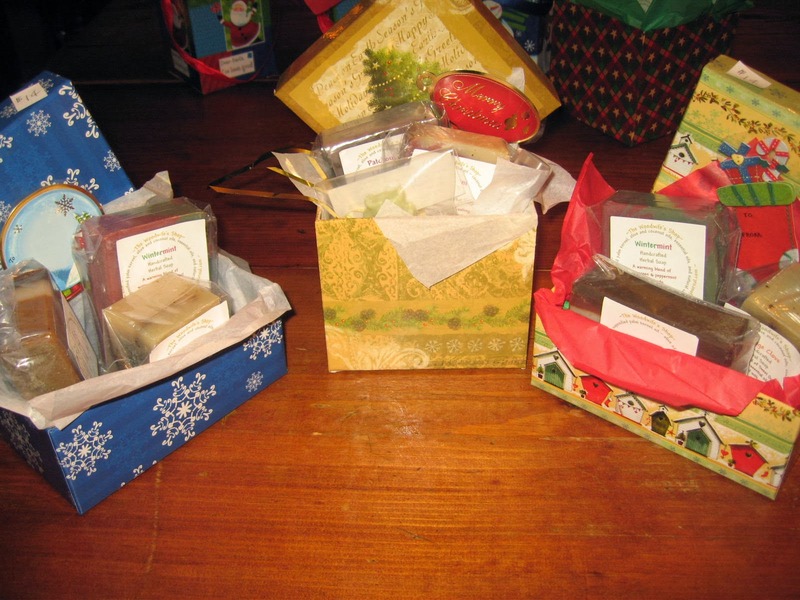 There are plenty of small businesses that offer wonderful gift ideas, some of them are even hand crafted! Take advantage of your local artisans, crafters, bakers and farmer's by shopping local this holiday season. Be sure to check out the carousel of Focus on the Family Radio Theater favorites. We've had the pleasure of using these for homeschool and just plain entertainment. It's easy to pop in a classic story to listen to while you clean or cook just like your favorite music CD. Need some quiet time with the kids? Gather around the radio and use your imagination to transport you to another time and place. They offer stories for all ages. It's hard to say which ones are our favorites because the classic choices are great! Little Women, The Chronicles of Narnia, Ann of Green Gables, A Christmas Carol, Les Mis, The Secret Garden, The Screwtape Letters, Oliver Twist and many more...they all come alive with a full cast of voice actors...often ones you'll recognize from the big screen like John Rhys-Davies and Andy Serkis. just click on the rolling carousel to enter Amazon. 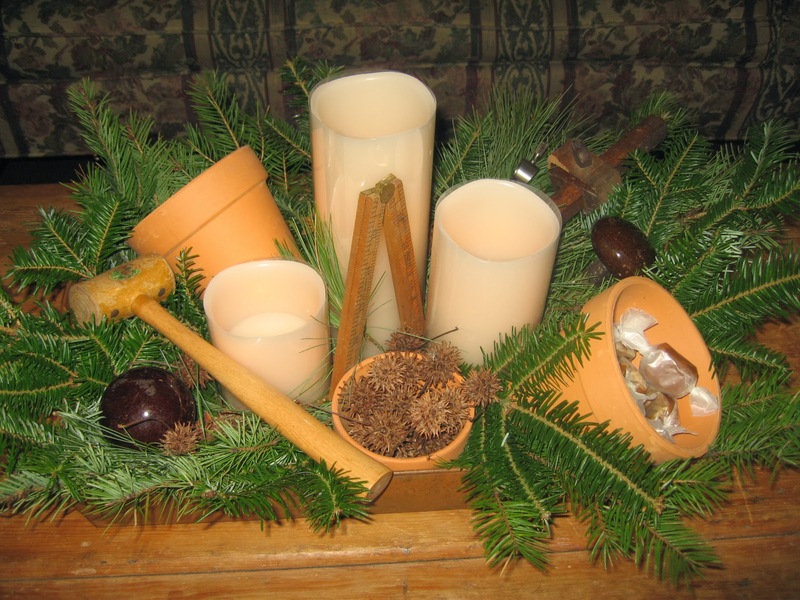 There are other affiliate links shown on the Woodwife's Journal for purchases through Mountain Rose Herbs, Tropical Traditions, LearningHerbs.com and Vintage Remedies. There's also a link to the Garden Tower Project where you can purchase a unique, space saving garden option that uses the composting power of worms, the compactness of a barrel and ease of maintenance to provide a wealth of produce from a small space. 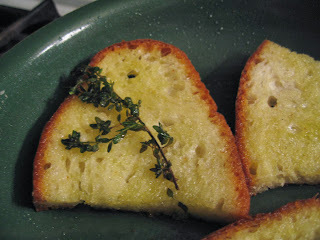 As promised, I'm sharing a couple small herbal things that happened in the Woodwife's kitchen this week. 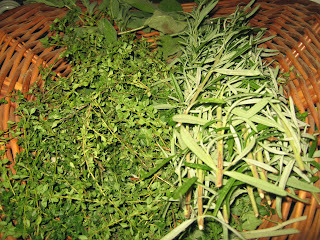 Here's my basket of herbs from the kitchen garden just before the last frost. I love to stand by the stone bed and smell the aroma of the herbs in the morning dew. That's not the time for harvesting but it's peaceful and soothing. 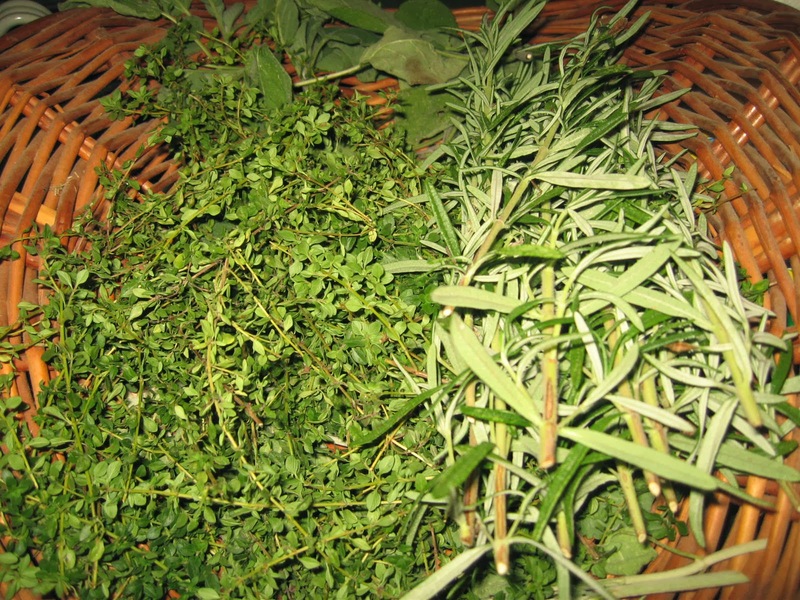 Rosemary, Lemon Thyme, Horehound and Sage were standing proudly in the crisp air. I gathered them later when the dew was gone and brought them into the kitchen. It smelled wonderful and I needed to find some way to capture their fresh goodness. The first thing I made was a gallon of lemon thyme water which sat on the western window sill catching as much sun as it could. 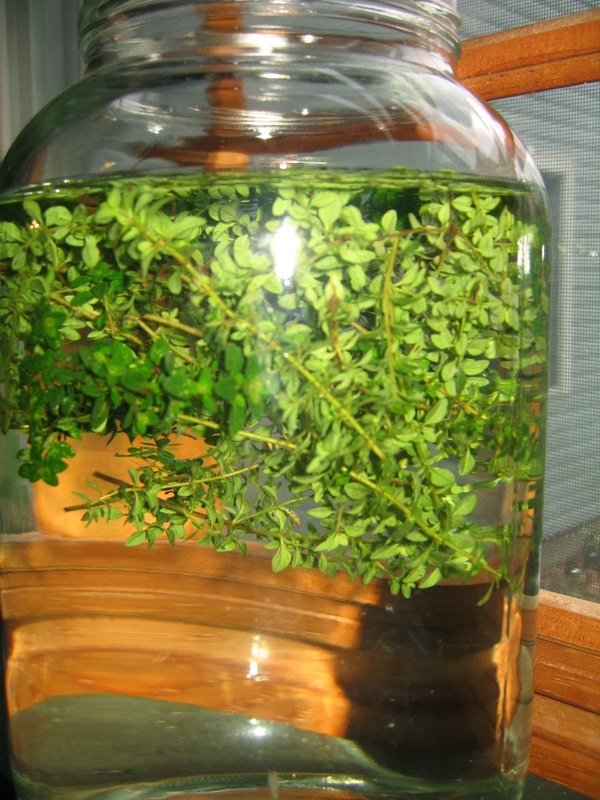 Herb water is so refreshing! Just drink as is or pour over ice to drink in the goodness! Next, I pulled out a thrift store treasure I'd picked up a few weeks ago and gave it a good washing. 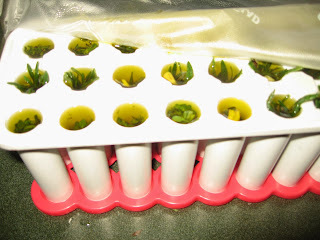 It was an interesting ice cube tray with several cylindrical cube tubes open on one end with a removable cap on the other. 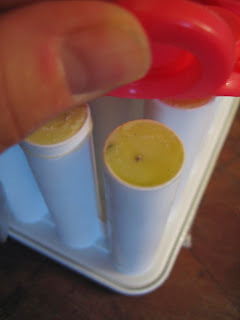 After allowing it to dry and snapping on the cap, I snipped my rosemary and thyme into shorter sticks and packed them into each tube with a sliver or two of fresh garlic. 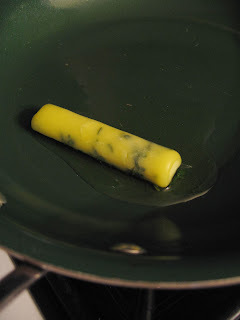 Next I covered them with olive oil. After covering the tops with plastic wrap (yikes) I put the tray in the freezer. Here's what they looked like after freezing. 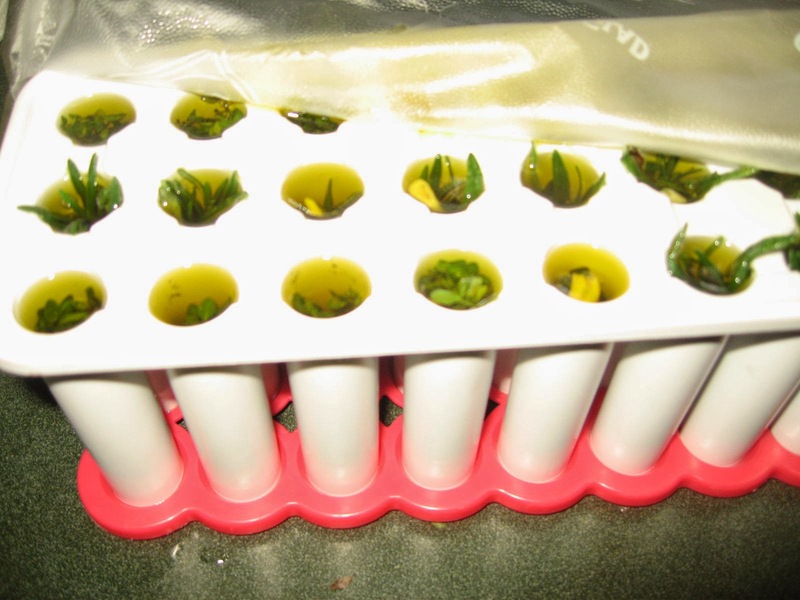 The advantage of having a removable cap on one end is being able to push one or two herb cubes out of the tray at a time with out melting the oil much. Now I'm all set to cook up my favorite dish with herb, olive oil and garlic all in one! With a little dollup of yesterday's batch of sour cream and I'm all set...Yummy! Coffee Enemas ~ What's All the Hype About? Years ago, a dear friend was diagnosed with cancer. My desk was right next to his and I watched as the disease slowly wore this big man down. His outlook was such an encouragement to me and I feel blessed and very sad to have been so close during this time. And how silly to be thinking about myself. He was very open about his journey and shared some of the special foods and alternative treatments that were suggested. One was a coffee enema. What!? Amazed, I had lots of questions and decided to try one on myself. It was the most energetic 3 days or 72 hours of my life even though I think I was only able to sleep for about 4 of them! After the initial shock, though, I have to admit that I felt great. Of course being mid twenties and fairly healthy, I wasn't battling any huge mountains either. So after satisfying my curiosity, I put it out of my mind. My friend worked hard and had the support of a very caring, loving wife and daughters. His struggle eventually kept him at home and we only had a few updates during his last few months because the family was so focused on making him comfortable and caring for his needs that they barely had time to think of anything else. I'm sorry to say that the cancer won that battle. RIP John. But now that I'm older, I'm thinking about these things a lot more. So when I saw this article about Coffee Enemas, I wanted to know all about them. The article is written by a gal on the GAPS diet who was skeptical of this liver detox method...until she tried it. She shares a lot of info and answered a lot of my questions. The thought of a redo is looming in my near future. Of course, nearly 30 years later, I'm facing a few more mountains now. Read what she has to say and decide it this is something you think might be helpful in your health journey. She also shared a link to a colonics page that shows this amazing chart. Here's the link and the chart. Is this news to you? It was for me! And the part about how the coffee gets from your colon to your liver... fascinating! Check it out.